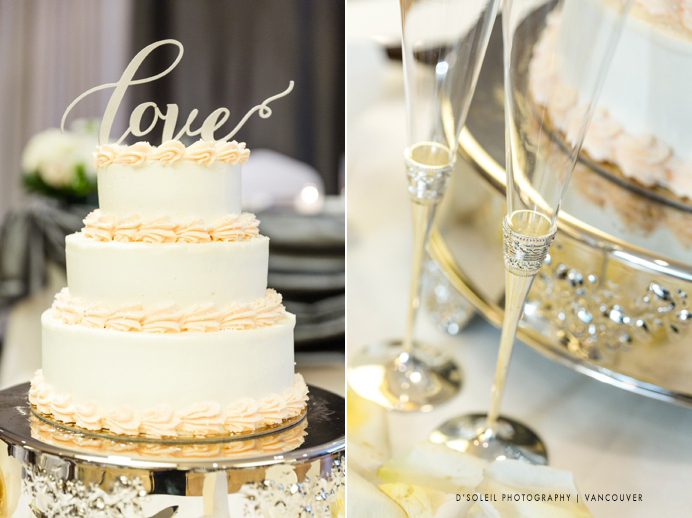 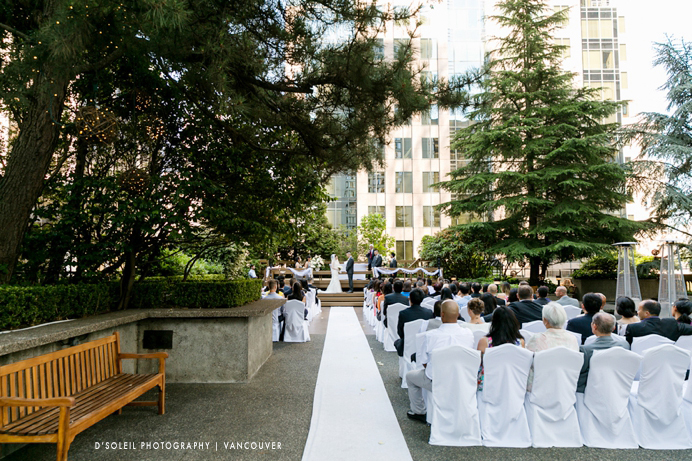 A Four Seasons Hotel wedding in Vancouver is usually one where all your expectations for your big day can be met. 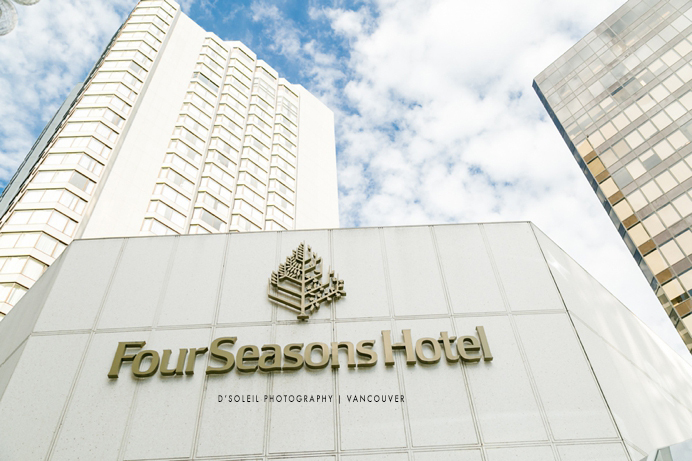 The Four Seasons Hotel serves as an award-winning venue that is well known worldwide for its quality of service and attention to detail. 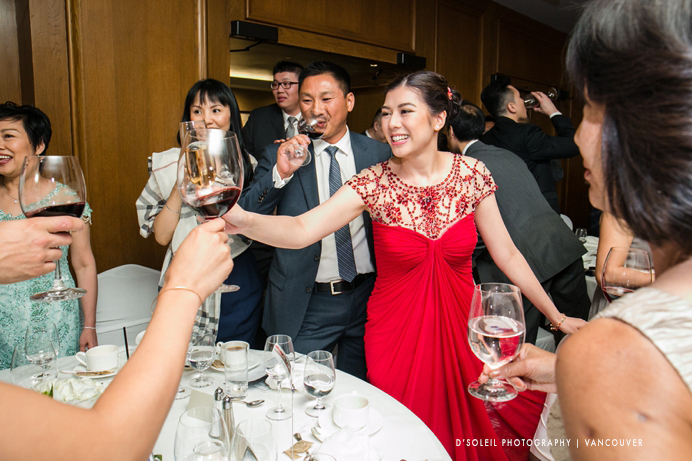 It has been awarded a Forbes Five-Star rating. 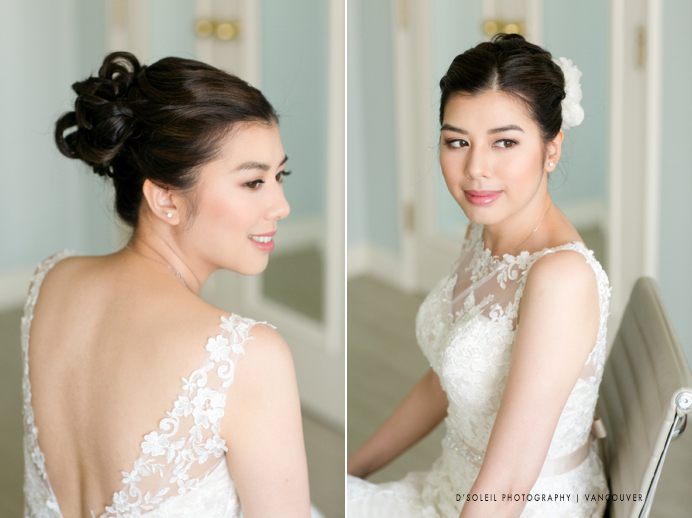 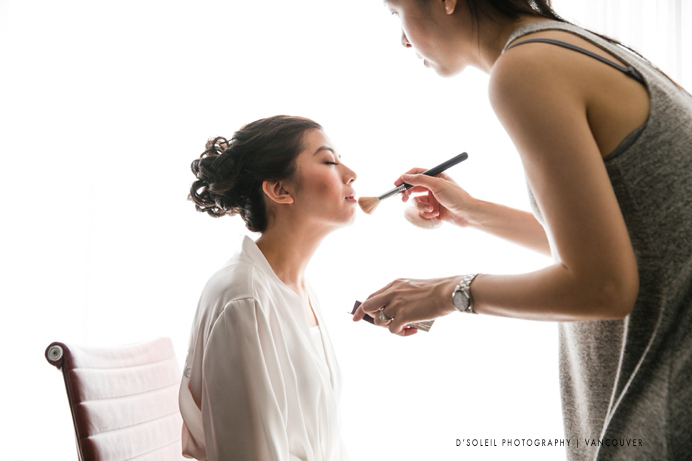 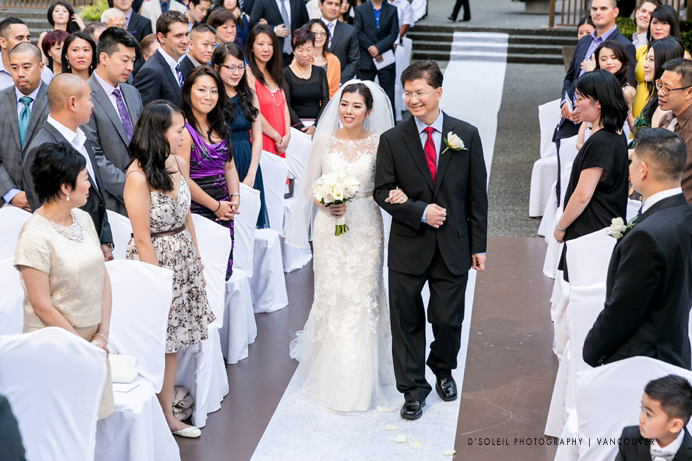 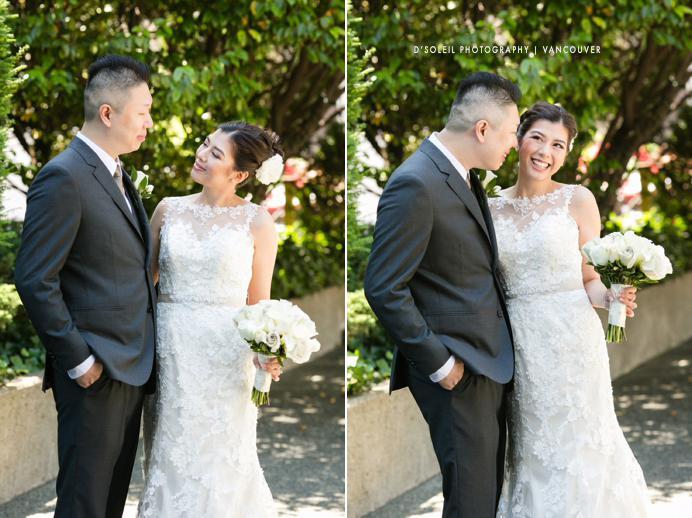 Michelle + Ken celebrated their Four Seasons Hotel wedding on one of the nicest and warmest summer days. 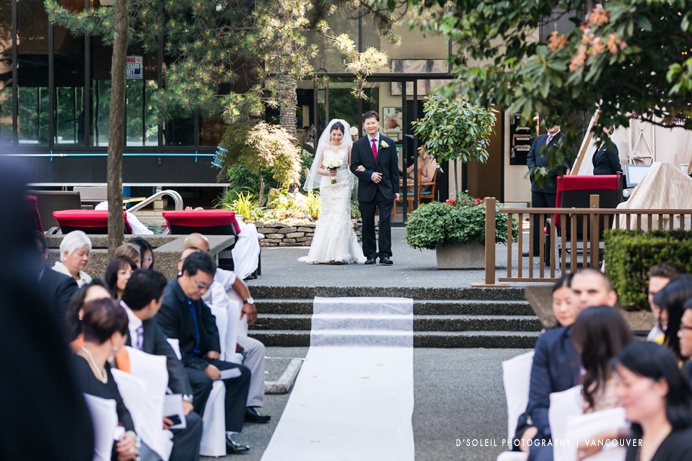 They chose an outdoor summer wedding ceremony on the pool deck and patio. 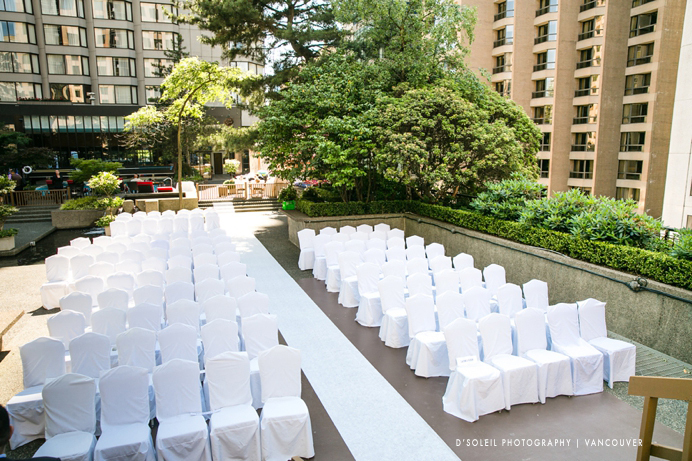 It is a large outdoor venue that can seat a large number of guests. 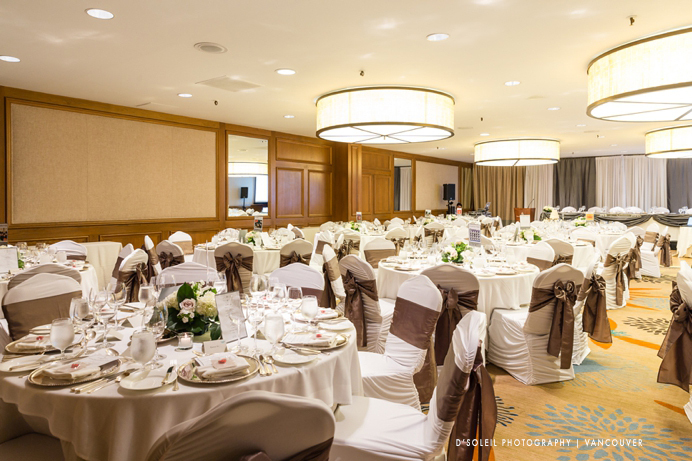 They later hosted a dinner reception in the Arbutus room on the Hotel’s third floor. 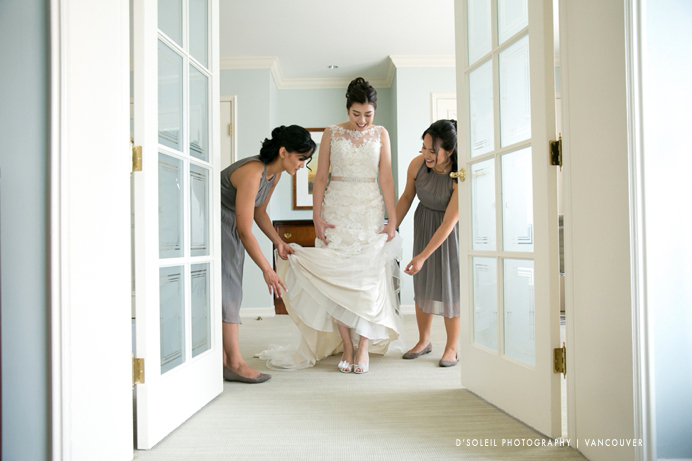 Michelle chose a beautiful laced vintage dress. 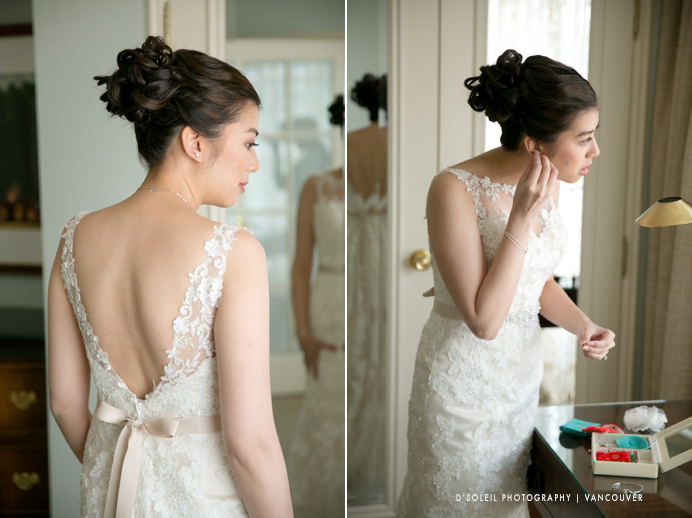 A timeless wedding dress that turned a lot of eyes that day. 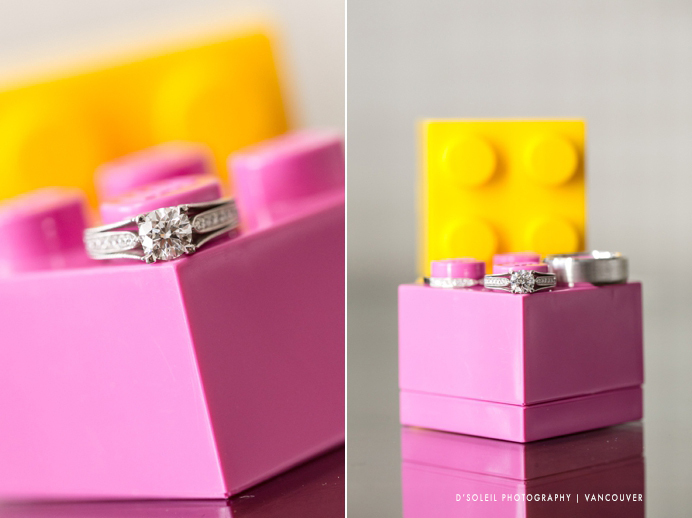 One of the most unique boxes I’ve seen were a pair of Lego ring boxes, representing one of Michelle and Ken’s favourite past-time activities. 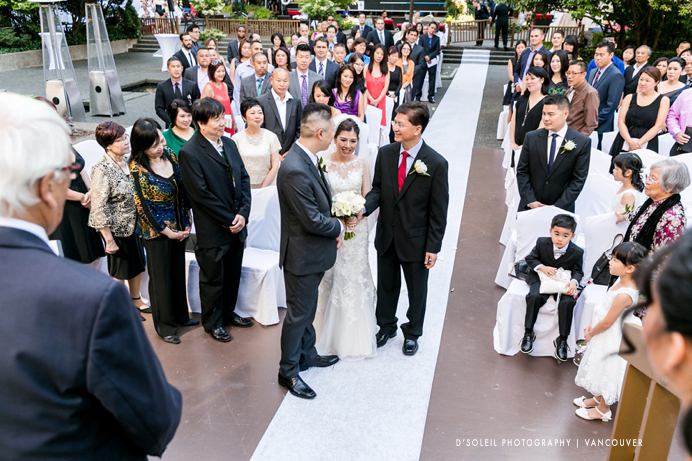 Michelle also had a beautiful red Chinese dress (Cheongsam) for the traditional ceremonies portion of the day. 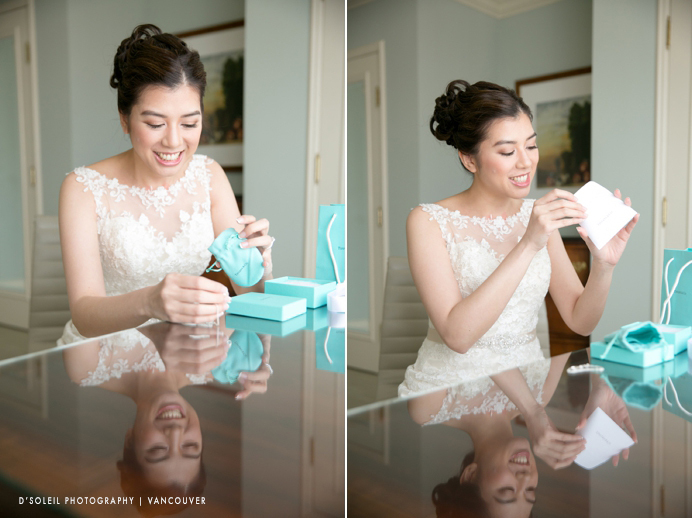 Michelle was given a surprise Tiffany & Co. gift that afternoon, and she had some Coach gifts of her own for her bridesmaids. 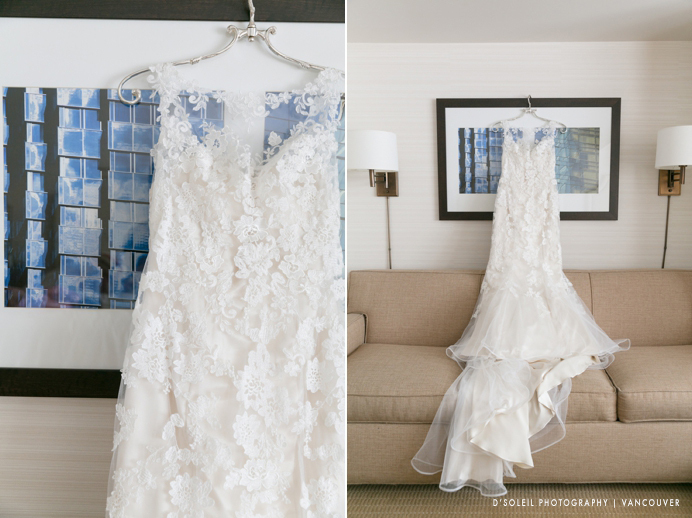 A Four Seasons Hotel wedding wouldn’t be complete without a few splurges on luxury gifts that no one could turn down. 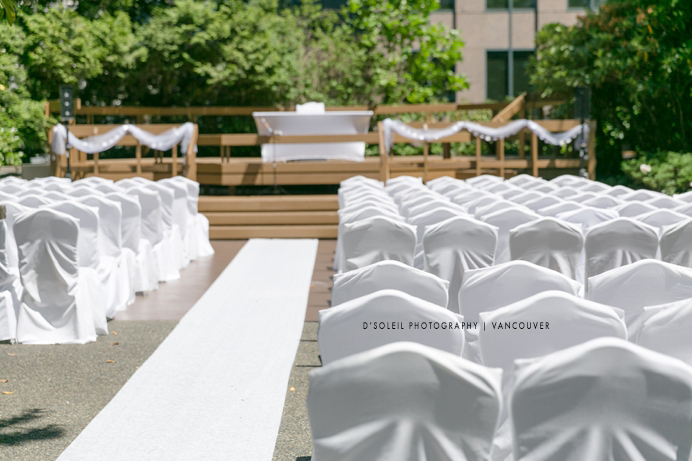 Before the wedding ceremony, they did a first look at the outdoor pool deck before we travelled to False Creek for photos. 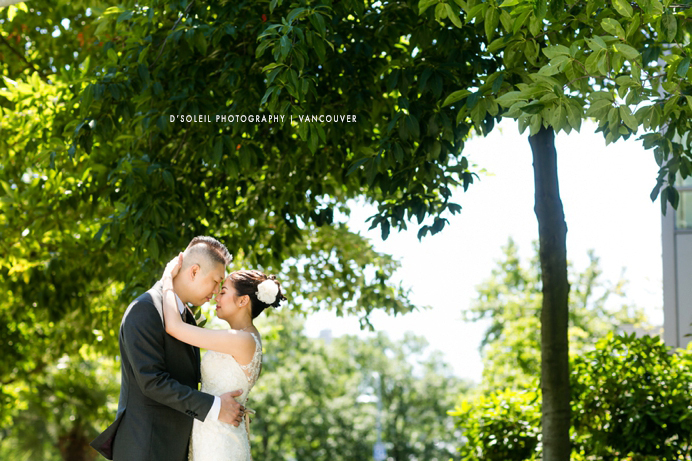 It was an extremely hot summer day. 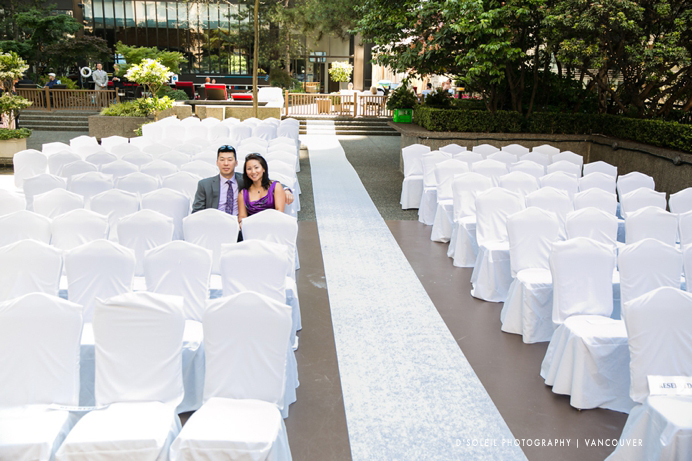 so just about everything we did was in or near the shade. 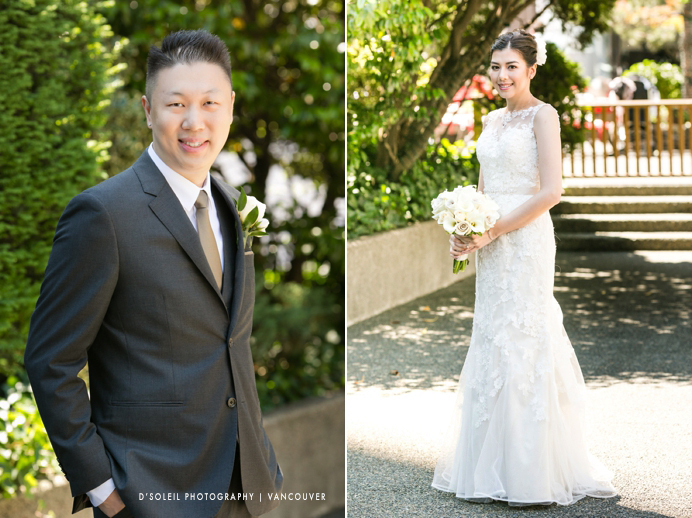 Portraits of the bride and groom were done around False Creek and Yaletown in downtown Vancouver. 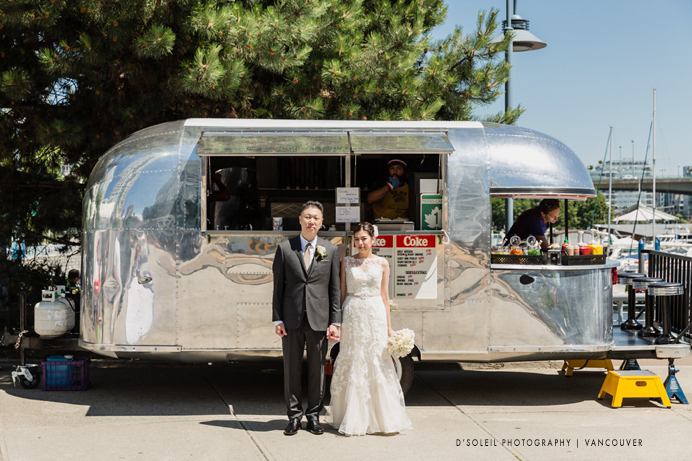 We found this Vancouver food truck near the marina, and I couldn’t let a quirky photo pass, even as near 30 degree heat was beating down on the entire wedding party. 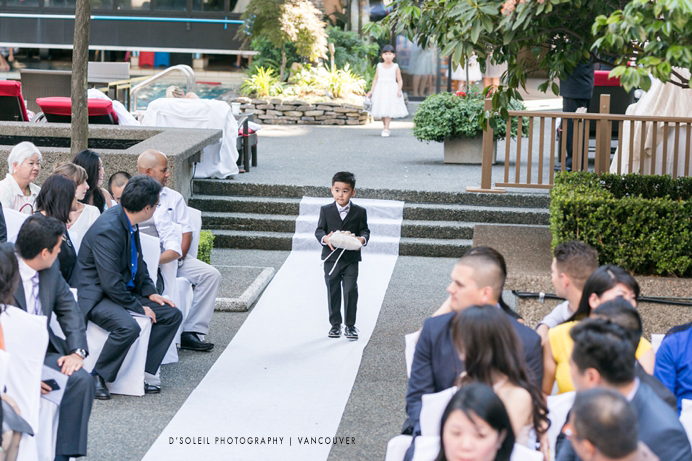 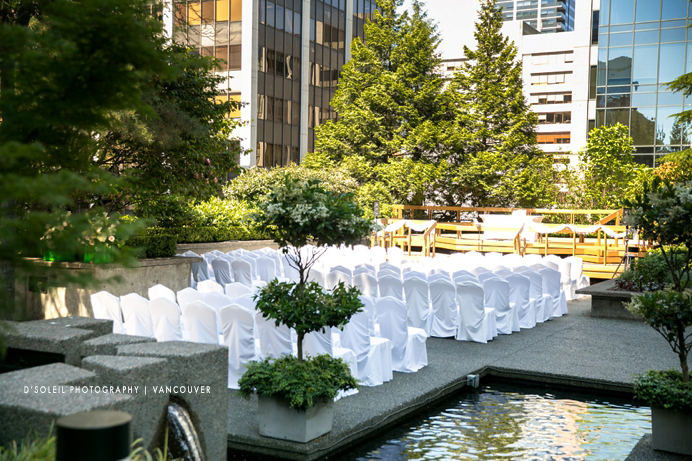 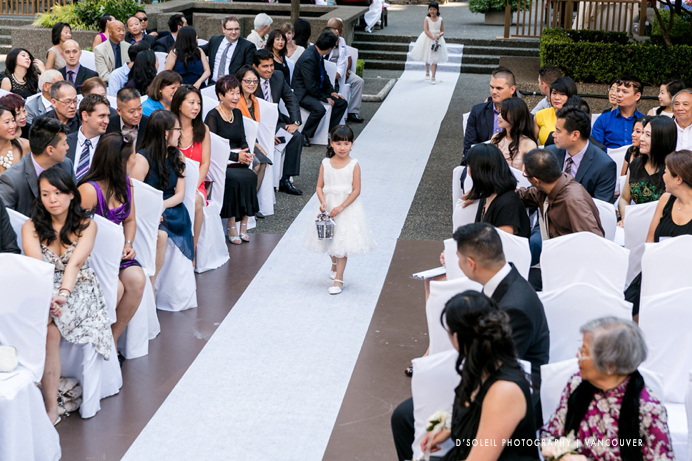 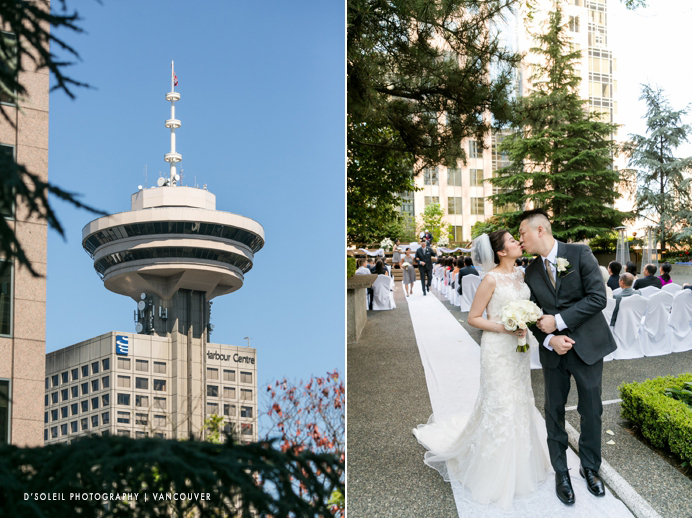 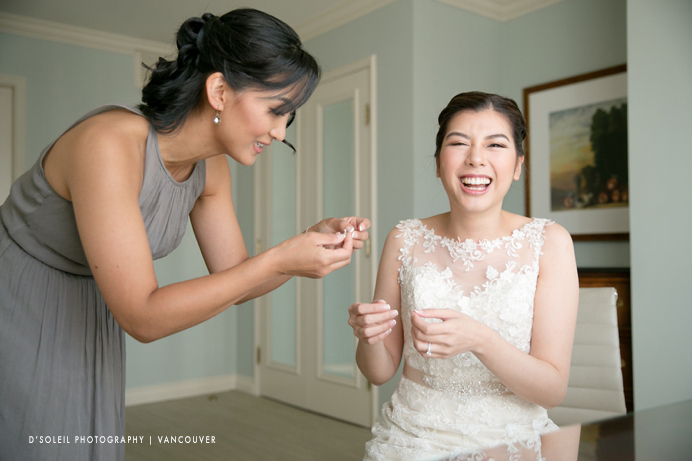 In the late afternoon, as the sun slowly began to descend behind the tall office buildings of downtown Vancouver, guest began to arrive for their outdoor Four Seasons Hotel wedding ceremony. 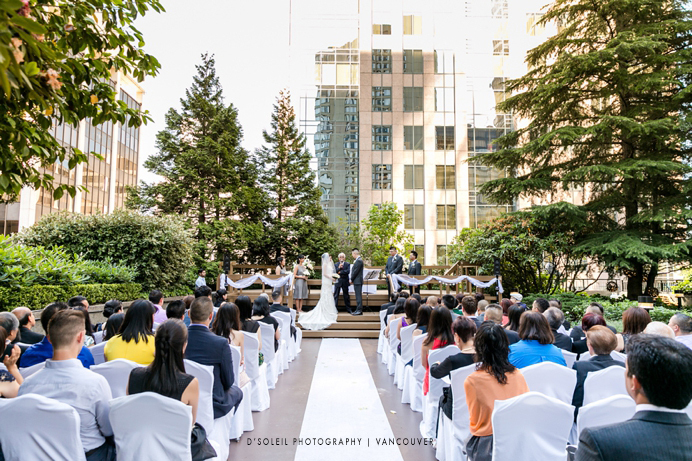 Michelle and Ken chose the perfect time for their late afternoon ceremony because almost the entire Four Seasons pool deck and patio was in shade, keeping all the wedding guest nice an cool on a very warm summer day. 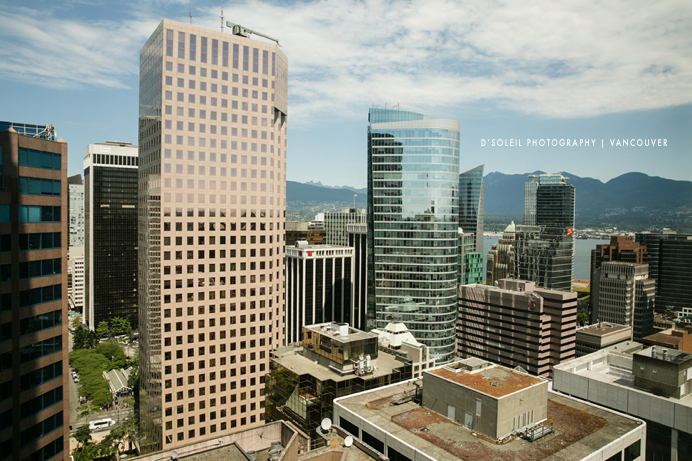 One of the coolest things about being at the Four Seasons Hotel in Vancouver is it’s close proximity to Pacific Centre. 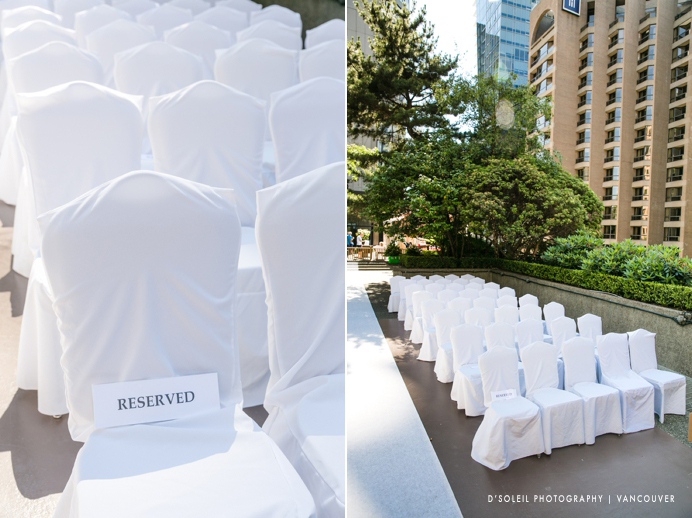 Wedding guests who need to kill some time just need walk directly into the mall from the Hotel’s doors. 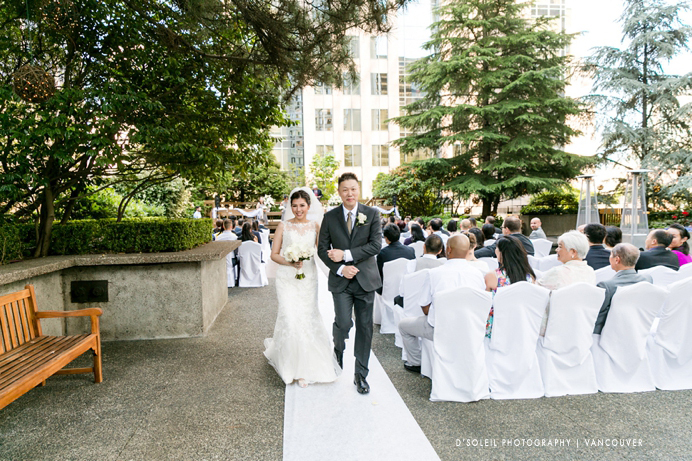 Just a few steps away is the Apple store too, just in case one needed to charge a phone battery, or browse some new tech toys. 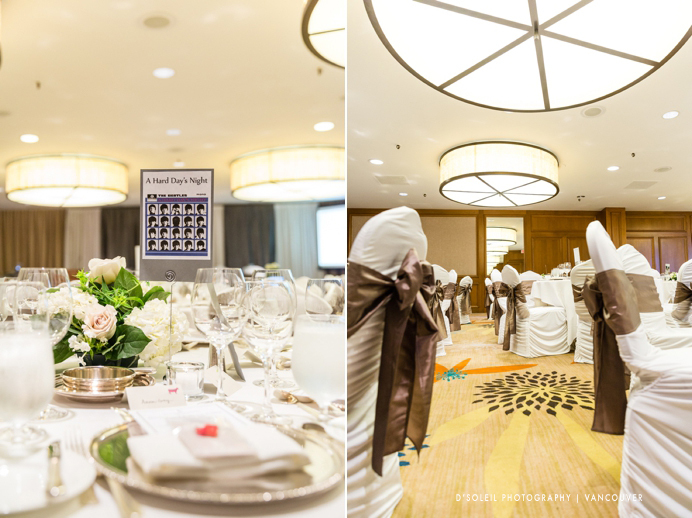 We’ve photographed weddings at the Four Seasons a few times and we have always been very impressed by their food. 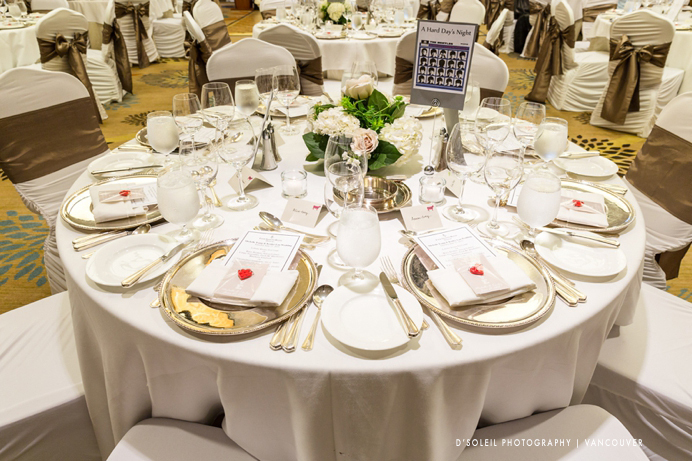 Haven spoken to some of the guests during the wedding reception, we know many of them loved the reception dinner too. 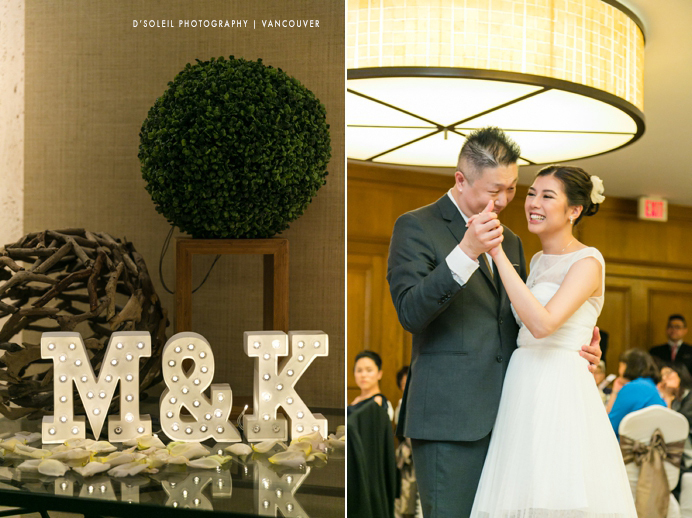 After toasting tables and final Thank-You speeches by the bride and groom, it was finally time for dancing, visiting guests, and a photobooth in the foyer. 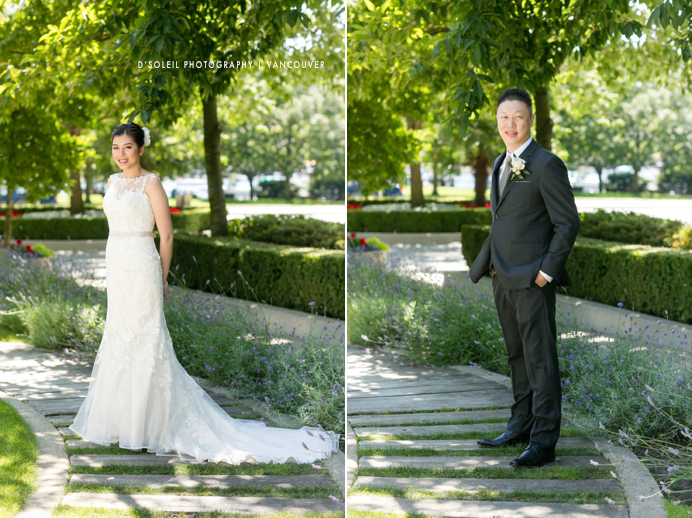 Congratulations once again Michelle and Ken.